Is this a Japanese sea ? Today it was really warm and a beautiful day in Shirahama ! The air was very clear and we could see Amagi mountains and Izu Oshima island. Besides the color of sea was just emerald green. When I was taking pictures in the beach, some poeple came there and said….. This entry was posted in beach on 2006年3月31日 by izusakuraya. We usually serve a Beef steak as a main dish of first night’s dinner. But we started to provide this menu for those who don’t like a beef or can’t eat it. 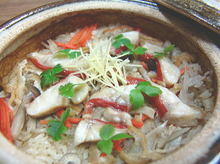 This is a "Meuniere of Fish with Itarian souce" using fresh fish from Shimoda fish market. Yes, we provide it in stead of beef for you until April 31st ! This entry was posted in Meal on 2006年3月29日 by izusakuraya. When we went shopping to Shimoda, we went to "Shimoda Nesugatayama Ropeway" with my wife, my daughter and my son. 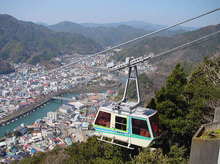 In Japan we, Japanese, call a Cable car "Ropeway". There is a ropeway station in front of Shimoda train staion. And it takes only 3 minutes and half to the top of mountain….. This entry was posted in Amusement Park, Family on 2006年3月28日 by izusakuraya. Shimoda is very famous for fresh fishes. 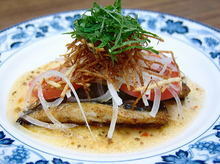 Especially this Shimoda’s fish "Kinmedai"in Japanese, "Alfonsino" in English, is most famous in Japan. That’s why we started to sereve this meal "Kinmedai Kamameshi" as a dinner’s menu from this month until the end of April. I can’t explane it in English well, but it means alfonsino, rice and vegitables are cooked with soysauce, sake in a ball. This is Japanese traditional cooking. Why don’t you order this ? The price for 2 people would be 2,000 yen as a extra charge. This entry was posted in Meal on 2006年3月27日 by izusakuraya. Yesterday our guest asked me that he is looking for a beach which he watched in a TV program and at the Osak train station. So I went to take pictures for him today. 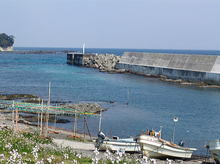 This is one of them "Itado port" in the north area of Shirahama. There are many ships for fishing of Japanese spiny lobstar, top shell, squid, jack mackerel, alfonsino and etc…. . This entry was posted in beach, Family, Sea on 2006年3月27日 by izusakuraya. 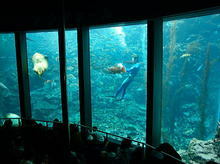 Today my son and me went to Aquarium in Shimoda with a family of my friend of university. I have ever been this aquarium many times, but it was first time for my son. He was very excited there. This aquarium has many places to see, and this is one of them "Floating Aqua Tank". This entry was posted in Amusement Park on 2006年3月26日 by izusakuraya. We had a strong wind today in Shirahama. 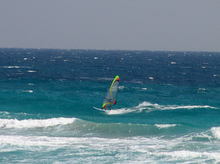 When I went to the beach, I saw some windsurfers there. The wind was not so strong, but they run on the sea with high speed. It was very warm today, so they felt really excited. By the way today’s Yuuki ……. This entry was posted in 未分類 on 2006年3月25日 by izusakuraya. When I went for shopping I went to "Shirahama Chuou Beach" with my daughter and son. This beach is on the opposit side of Shirahama Ohama beach which is nearest one of Sakuraya. And this beach has some woody teracce and path along the sea. Several years ago this beach had been selected as one of 88 beautiful beach of Japan. Shizuoka Prefecture has only 2 of them….. . This entry was posted in beach, Family on 2006年3月24日 by izusakuraya.
" It will be sunny this afternoon." the weather forcast said, but actually it was almost cloudy at all. 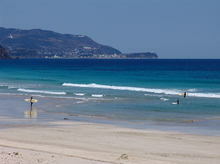 I am very sorry that our guest from Italy could not see beautiful Shirahama beach. 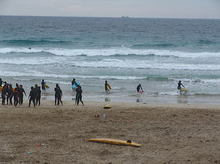 When I went to the beach, there were many lifesavers who were students of university and were practicing. Besides they are all women !! I was really surprised. By the way I show you today’s my son, Yuuki, ……. 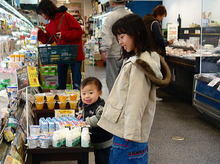 This entry was posted in beach, Family on 2006年3月23日 by izusakuraya. Today my wife, my children and me went to Shimoda for shopping. I sometimes go to supermarket with my son. When he was baby, I bought holding him. But he recently wants to walk in a supermarket by himself. Probably he wants see and touch everything. By the way I found one thing that I want to introduce…. This entry was posted in Shopping on 2006年3月22日 by izusakuraya.